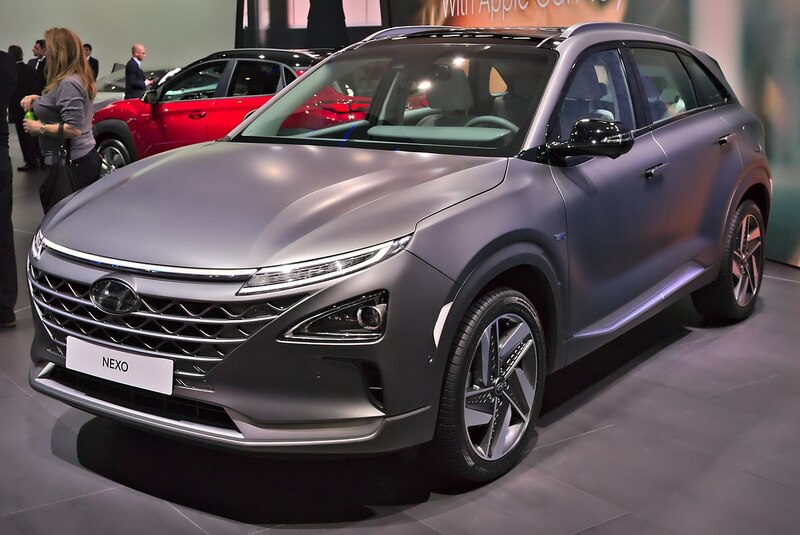 Hyundai Nexo at Geneva Motorshow 2018. Image by Alexander Migl - Creative Commons. On Thursday, platinum futures dipped below $800 an ounce as the metal slides back to near 15-year lows first reached in August. Investors have lost interest in platinum with ETF holdings dropping to five year lows. Other indicators are also bearish – the last time platinum traded at this deep discount to sister metal palladium was in 2001. In 2008, platinum was at a $1,750 premium to palladium. As for the relationship with gold, platinum was still trading near par in February this year. But this week brought some good news on the long term outlook for the metal. Platinum's primary use is in catalytic converters to scrub emissions, particularly in diesel vehicles. Tighter regulations implemented around the world following the Volkswagen cheating scandal three years ago has steadily eroded the metal’s attractiveness to investors. Full battery electric vehicles makes platinum-based catalysts obsolete. But the alternative zero emissions vehicle technology – hydrogen fuel cells that only emit water vapour – needs platinum by the ounce. The precious metal adds to fuel cell cars' already hefty price tag, and billions are being spent on research to reduce that requirement. But even if loadings are cut it in half we are still looking at 12-15 grams per vehicle. For now though, the pressure will remain on the platinum price. The global market will be oversupplied by just over 500,000 ounces this year and 455,000 in 2019, according to a November report by the World Platinum Investment Council. This is mainly due to weak demand from the auto sector and comes despite a pickup in platinum jewellery purchases forecast for next year (the first increase since 2014), the main source of demand next to catalysts. The report also forecasts increased recycling and little evidence of substitution of palladium for platinum due to the price discount. The consensus forecast for the platinum price as compiled by FocusEconomics is $886 an ounce in 2019 and $964 in 2020. TD Securities is the most bullish, believing platinum could scale $1,000 an ounce by the second quarter next year. The most bearish outlook is from Deutsche Bank, although it does not predict a decline from today's levels.